Republicans in Congress schedule Syrian refugee vote. 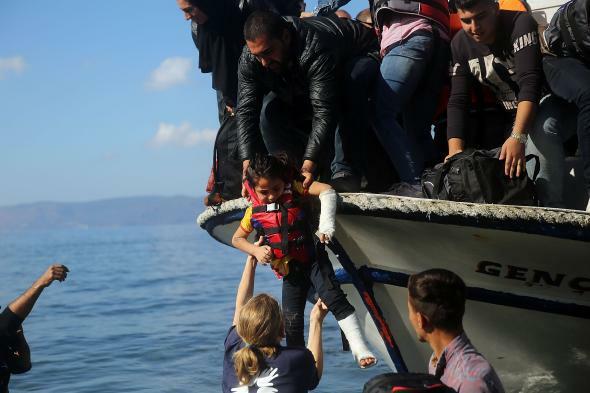 Republicans in Congress Plan Thursday Vote to Halt Syrian Refugees Coming to the U.S.
A child with a broken arm and leg is helped as she arrives with other Syrian and Iraqi refugees onto the island of Lesbos in Oct. 2015 in Greece. The measure is expected to force the FBI and Department of Homeland Security to certify that each potential refugee is not a threat to U.S. security. Top GOP leaders said they expect some Democratic support in the House. Republican leaders moved swiftly to draft the legislation to halt President Barack Obama’s plan to accept thousands of refugees from Syria. Ryan (R-Wis.) told Republicans in a closed meeting Tuesday that he wants prompt legislative action for more stringent oversight over the refugee program, and he told reporters that he does not want to wait until December to use a government funding bill to take action. The bill is in response to President Obama’s call to accept some 10,000 Syrian refugees over the next year. “This is a moment where it is better to be safe than to be sorry, so we think the prudent, the responsible thing is to take a pause in this particular aspect of this refugee program in order to verify that terrorists are not trying to infiltrate the refugee population,” Ryan told reporters Tuesday. Under the terms of the proposed bill, resettlement of refugees would be suspended until they could be deemed “certified” by Homeland Security. “In the Senate, several Democrats defended the [current] program assessing Syrian refugees as painstaking and rigorous and pointed to as evidence the low number of Syrian refuges allowed into the country over the last four years,” CNN reports. “They also said many of the vetted refugees were rejected. But they also said lawmakers and the public need more information on exactly the program works before they can assess if changes are needed.” Administration officials are scheduled to brief House members on the current vetting process on Wednesday.